The Snallygaster swooped out of the ether and into legend in February of 1909; appearing in Middletown, Maryland newspaper the Valley Register. The paper described the creature as having "enormous wings, a long pointed bill, claws like steel hooks, and an eye in the center of its forehead," and it was said to make a noise "like a locomotive whistle." The beast reportedly seized a man and drained him entirely of blood prior to discarding him atop a hillside. That report began a series of stories surrounding the Snallygaster, which faded away in March of the same year. The Snallygaster returned in the fall of 1932, when The Evening Sun in Baltimore reported that Charles F. Main and Edward M.L. Lighter were "frightened nearly out of their wits when the beast suddenly appeared flying over the National highway toward Catoctin Mountain, near the old White House, just east of Braddock Heights." The two men claimed the creature appeared suddenly out of the south, and was flying no more than twenty-five feet in the air. 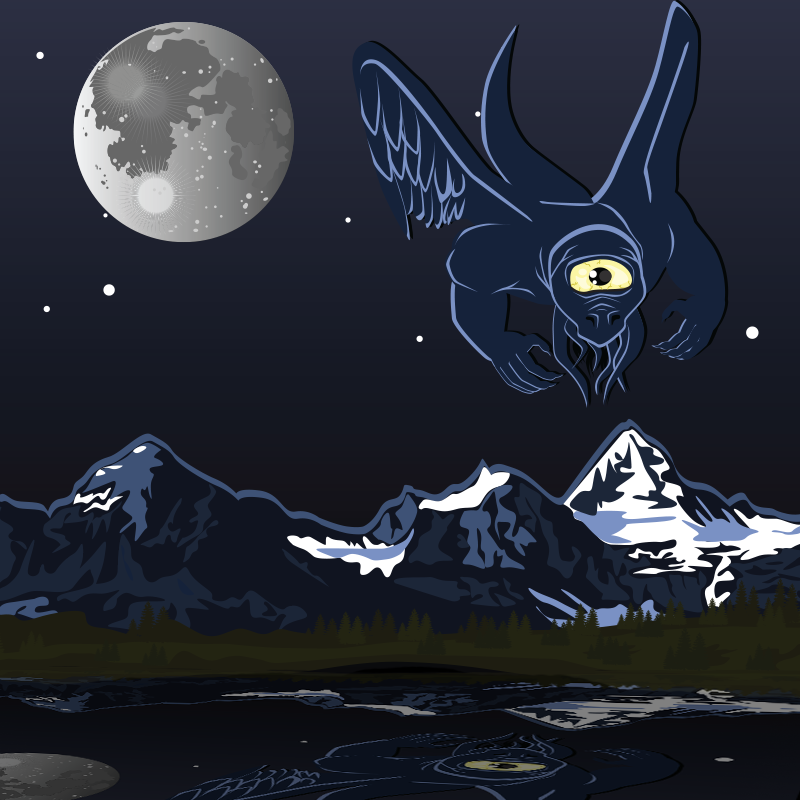 At first, the Snallygaster appeared to be heading right for their vehicle, but when it was about fifty feet away it veered to the north towards the mountain. Main said he saw the Snallygaster change color several times, switching from white to black; its wingspan was between twelve and fourteen feet, and "it threw out long streamers like the arms of an octopus, but would then draw them in again." Main and Lighter thought that perhaps the creature had alighted in a mountain not far off the highway, but by the time they gathered the courage to investigate, no trace of the Snallygaster remained. "People who say there is no such animal are the ones who need to get right--we are not," Main said in an article published in Frederick newspaper The News. "I saw the Snallygaster, and I saw him change from white to black." The Evening Sun reported in the same article that two boys out playing in the north commons saw a similar creature the Friday before Main and Lighter's sighting. That evening, Junior Fulmer and "Buddy" Haupt reported seeing a strange monster flying north toward Middletown from South Mountain. The boys were unable to say in precisely what direction the creature flew, since they were so overcome with terror that they almost immediately fled to their homes after spotting it. In early December of 1932 The News reported that the Snallygaster had been shot and captured, but the animal taken into captivity wasn't exactly the same as had been reported. A large owl with a wingspan of around three feet had its wing clipped by a bullet fired from the rifle of Harry Wachtel. According to the newspaper report, experienced woodsmen and naturalists agreed that the owl, with its "weird gray wings spread in the cold dead of night...could be taken for a 'Snallygaster.'" A more colorful explanation for the disappearance of the Snallygaster after November of 1932 also appeared in The News. According to legend, the creature "met its end when, attracted by fumes arising from a 2,500 gallon illicit liquor vat in the Frog Hollow section of Washington County, it lost control of its wings and dropped into the mash." Prohibition agents who raided the illegal still a few days later found little left of the Snallygaster, save its bones, since the liquor had eaten away most of the creature's flesh. A few sightings of strange bird-like beings kept the legend alive in Frederick County throughout the 1930s, but by the mid-twentieth century the creature had all but faded from the public consciousness. Many regard the early twentieth century newspaper reports as a deliberate hoax to drum up sales, and there is no denying the legendary nature of those stories; but it's certainly possible that, by the '30s, the creature had become a sort of catchall explanation for anything strange seen flying around the area--and that maybe there is some unexplained element to the Snallygaster after all. The thing described by Main and Lighter in 1932 doesn't exactly match the one-eyed monster from 1909, and perhaps the legend provided a convenient narrative to frame their experience. In any case, if you find yourself in rural Maryland, near the mountains, keep your attention skyward, lest you be surprised by the tentacled flying horror known as the Snallygaster.